← Enterprise 2.0: part 2 – the world around us has changed, forever. The following article is also published through pharmaphorum and is the third in a series about Enterprise 2.0. As with a lot of technological innovations, business is often behind adopting them compared to consumers. This was the case with the telephone, with the adoption of email and today with new and social media. Now, when social computing is becoming mainstream, businesses are considering how to deal with this within their own organisation. 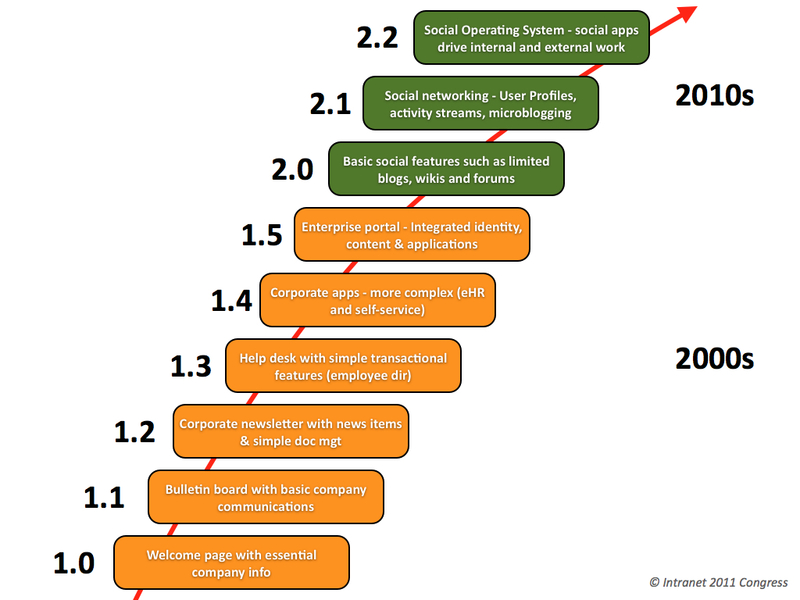 The question therefore should not be if a company should adopt social computing (aka Enterprise 2.0), but more when. As discussed in the previous episode of this series, many employees struggle in managing the enormous amount of information they have to process within their jobs. And the infrastructure that offers that information is not helping them in doing their jobs, on the contrary. Forty-two percent of our economy is based on ‘tacit interactions’, which means exchange of information and knowledge directly between knowledge-workers (source: McKinsey). Most of this information is in these people’s minds, and not recorded in a database. In other words, a lot of this information is not secured. Twenty percent of their valuable time, knowledge workers are searching for information required to do their jobs. Indeed, searching, which does not imply that they always find what they need. Which makes sense, because part of that information is not available, as explained above. Eighty-five of the current available IT infrastructures cannot be accessed by most knowledge-workers (source: Gartner). That means that if relevant information is available somewhere in the database, they do not have the permission to access it. The gap between the adoption of new technology, in this case collaborative and social interactive media, between the corporate world and the consumer world has never been so apparent. Cloud computing, mobile, social media, we’re all familiar with it in our private lives. However, within our daily work, this is very often not the case. Cloud computing, for example, is by many organisations perceived a scary, insecure and non-compliant phenomenon. This is what we call consumerization of technology. New (information) technology first emerges in the consumer market before it enters business organisations. And when it enters, it is in most cases received with scepticism and distrust. IT departments are frequently hesitant in adopting these new technologies, especially if it implies loss of control or, in other words, empowerment of the user. When I was still working in the pharma industry I was always surprised at the ‘glass-is-half-empty’ approach of IT, when proposing experimenting with new and social media. While I sincerely expected, maybe naive, that this technological revolution should ignite the passion of every IT-worker. In fact we’ve reached a point of no return. More and more employees, especially the digital natives, expect free access to information, the ability to connect with co-workers andto share and exchange knowledge and experience, all online. As they are used in their personal lives with their friends and family. As long as the current IT infrastructures (i.e. the intranets and portals) don’t allow or facilitate this, they will take the initiative themselves to create that space. Already, employees ask their IT departments to give them access to their email and intranet through their personal mobile devices. Just because the company does not offer smartphones to all employees, but the sales force. These employees will get very frustrated if their request is not honoured. While the only reason for asking is helping them to do their job easier and better. Talking about the employee, what is motivating him (or her)? What really drives him to do his upmost to fulfil his tasks? What makes him get up in the morning? Is that salary? Is that a large bonus if mission is accomplished? Or is it something else? So now the urge is clear. Business organisations need to change, significantly. In the way they communicate with their employees, how they are motivated, in the way their workforce is empowered and in the way they are organised online. But where to start? That’s what I will discuss in the following episodes. First I want to ask you to take a look at your own organisation. How are you organised online? What functionalities does your intranet offer? Is it interactive and does it allow collaboration between co-workers. The figure below comes from the congress Intranet 2011, which was held in March recently Utrecht, The Netherlands. It represents the development of the intranet from a one-directional information source to a social operating system that contains all kinds of collaborative applications which drive internal and external work. Can you indicate where your company’s intranet is?